A “masterplan” for rejuvenating Crystal Palace Park was submitted in November 2007. Commissioned by the London Development Agency, the original aims were to increase the park’s profile as community, heritage, leisure and educational asset through restoring some historical park features and building new facilities. Various questions remain. What will the ultimate purpose of the rebuilt palace be: commercial, social or cultural - and what kind of tenants are we likely to see? How do we manage the impact on the local community and transport infrastructure of resurrecting such a major structure, likely as it is to attract large numbers of visitors? Finally, it looks like ZhongRong may obtain exclusive rights over a large section of the park that is currently designated as metropolitan open land - what will the impact be of such a deal on future developments in the park? And to what extent will the community have a say when it comes to final design, integration of facilities and the ongoing management and operation? 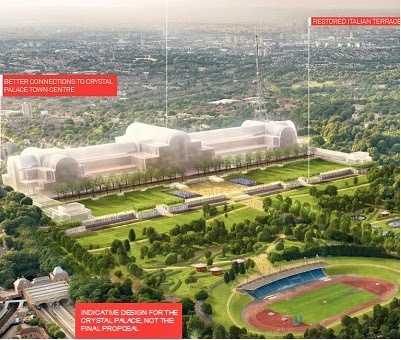 Visit www.thelondoncrystalpalace.com to see the latest proposal and www.crystalpalacepark.org.uk to get involved and have your say.